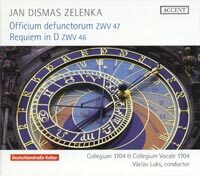 JAN DISMAS ZELENKA (1679-1745): Officium defunctorum, ZWV 47, Requiem in D, ZWV 46. Description: These two works made up the music for the funeral rites of Augustus the Strong, King of Poland and Elector of Saxony, in 1733. The Officium opens with an intense (think Bach St. John Passion opening) ten-minute Invitatorum which is followed by three Nocturns each consisting of three Lectiones from the Lamentations of Job and each followed by a Responsory (the final six Lectiones are sung in plainchant). Although Zelenka's orchestral accompaniment is quite varied and striking, it pales in contrast to the intense richness of the Requiem which makes much telling use of trumpets, horns, flutes, oboes, bassoons and chalumeau (the quintessential instrument of mourning at Dresden). 2 CDs.